With our TV cart you can easily set up a flexible presentation solution for variying meetings or classrooms with two big screen monitors. Thanks to the four wheels the cart can be pushed easily and also provides thanks to the looking mechanism a safe and sturdy stand. With the shelf you have enough space for additional promotional material or for your laptop or a soundbar. 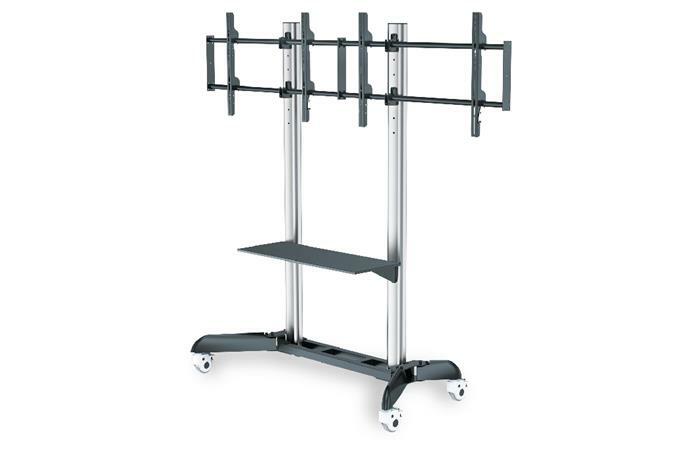 The cart supports screens between 37" up to 65" with a maximum weight of 64kg each. The universal TV cart allows you to install LED, LCD and Plasma TVs of all brands with a maximum VESA mount up to 800x500.